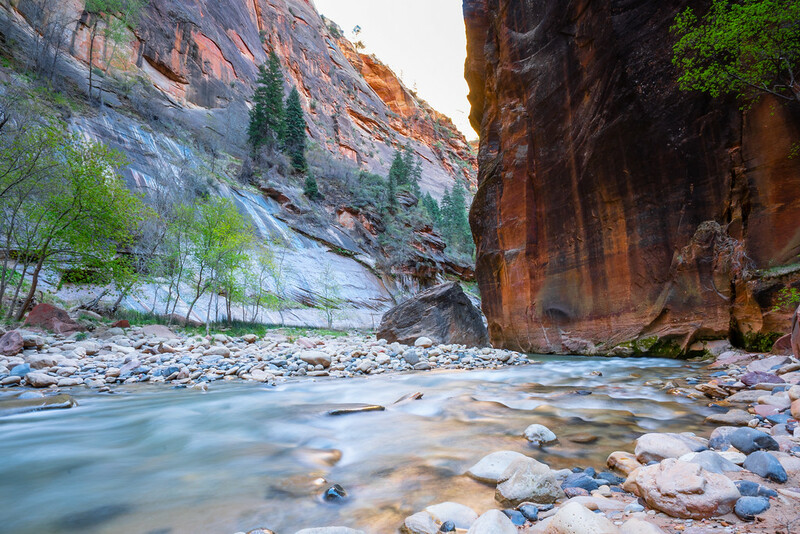 I finally got to hike the amazing Narrows in Zion National Park, and I was not disappointed! 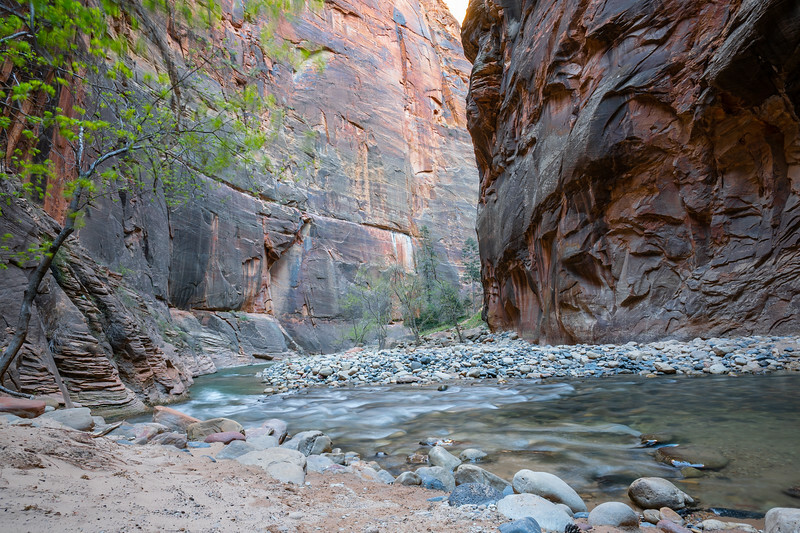 First off if you are hiking the day hike, you can not hike the entire Narrows, and this is often called the "Bottom Up" hike of the Narrows. 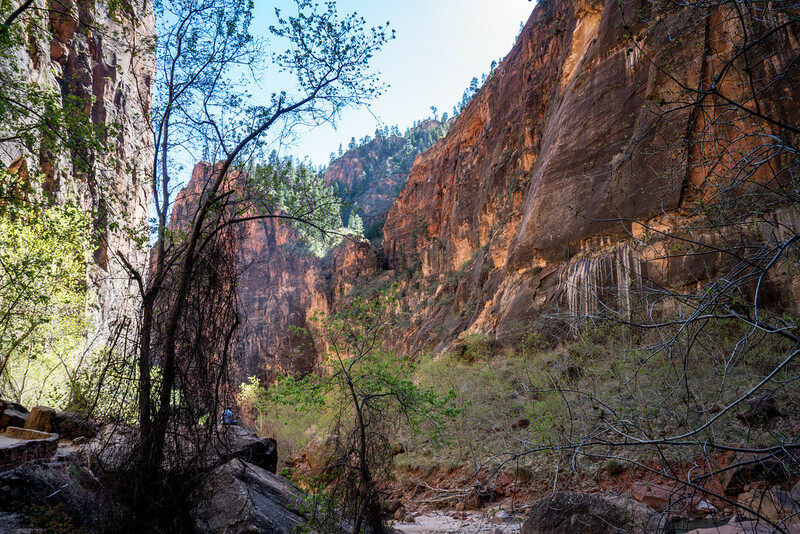 This trip report is not the entire Bottom Up hike as we started pretty late in the day, but where we lacked in the distance covered we regained in having the Narrows all to ourselves on the way out! 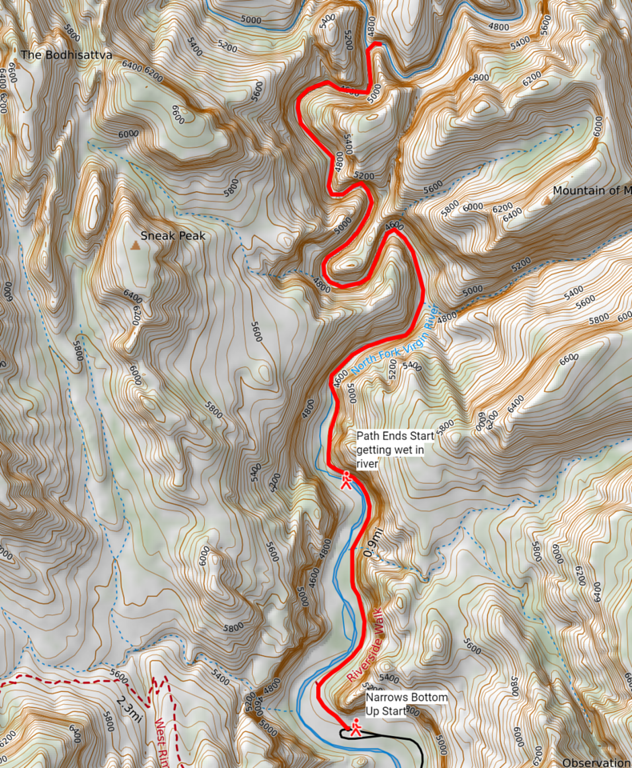 If you would like to see a map of the hike we completed you can see my custom map on Caltopo here . We did this hike in Mid April 2018, and I was torn on if we needed to rent gear to complete this hike. 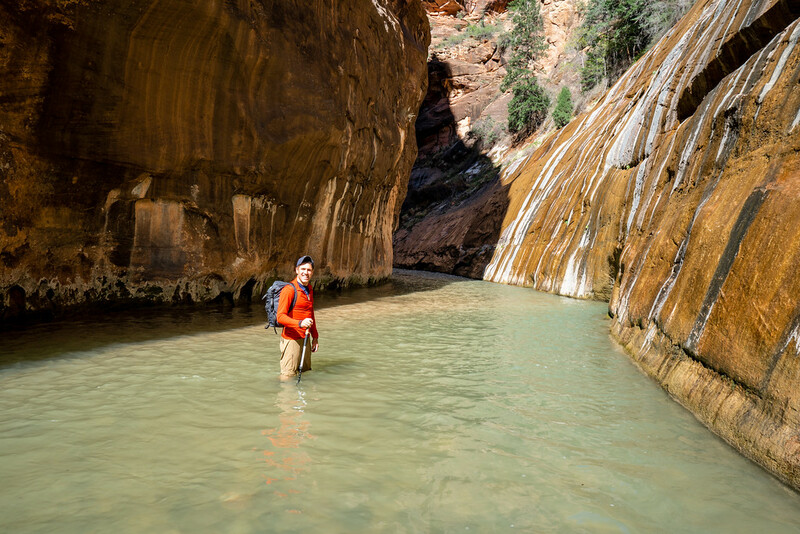 There are multiple stores in the town just outside of the National Park they will rent you special shoes, waterproof pants, dry suits and walking sticks. I even saw one store advertise the water temperature as 45 degrees Fahrenheit. I absolutely hate cold water and thought about renting the gear but ended up doing so, and I was happy with my choice not to do so. On that note, water temperature and levels can change instantly, and I am not saying do not rent the gear, but it may be worth checking out the river yourself before spending your money on gear you may not need. One piece of gear I would recommend is a hiking stick, we didn't rent these because I brought my own but they will help give you balance when you walk in the water and help you check the depth if you can not tell. 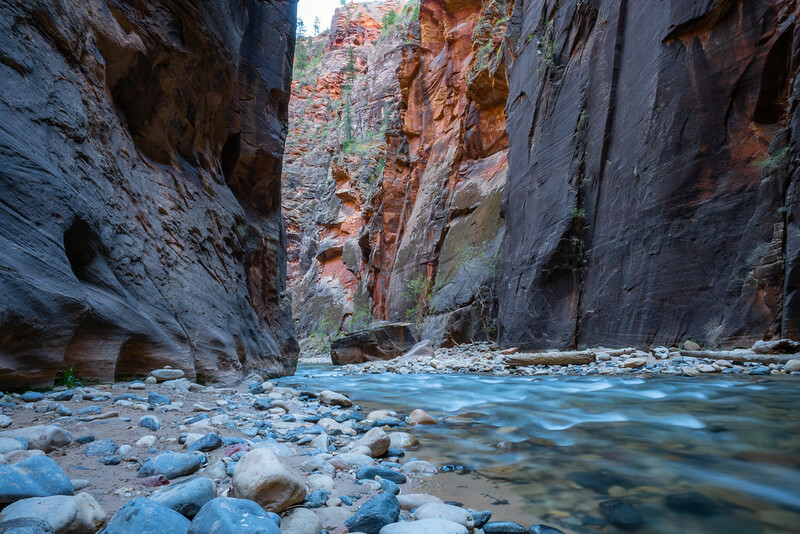 The first mile of this hike is paved an pretty easy. 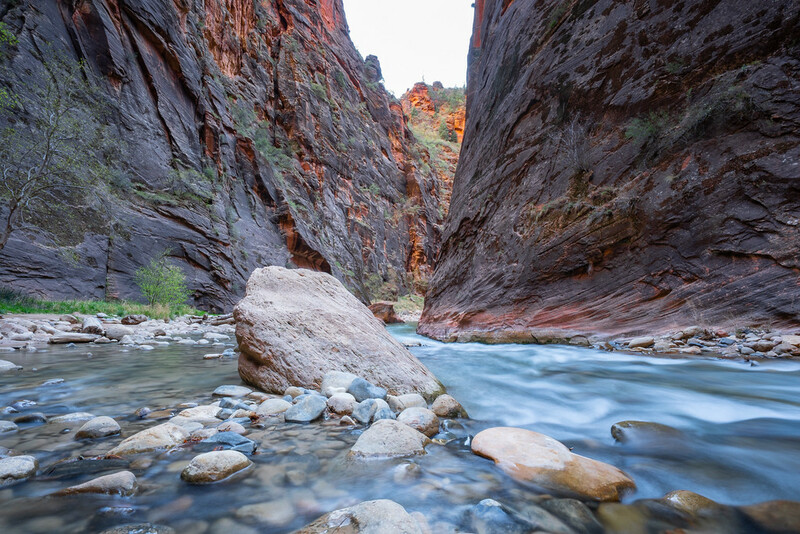 If you just want to check out the beginning of the Narrows or have a picnic lunch on the edges of the river feel free just to take the river walk and turn around before its time to hike through the river. 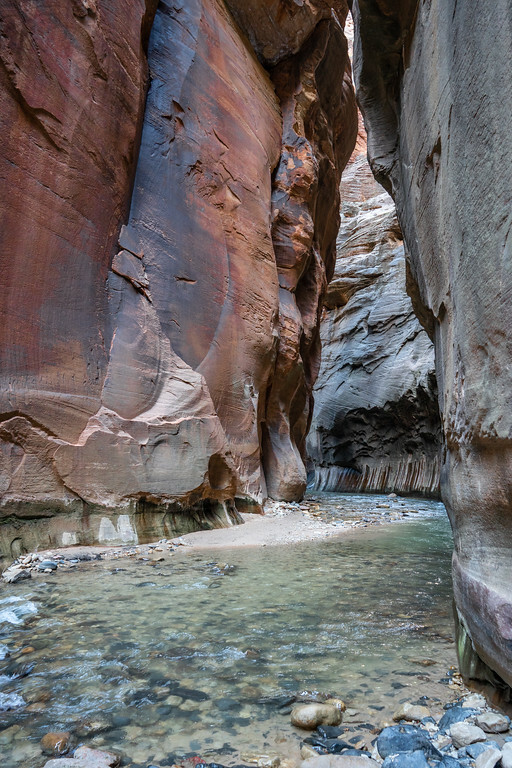 The first part of the Narrows plunges you into the river fairly quickly. 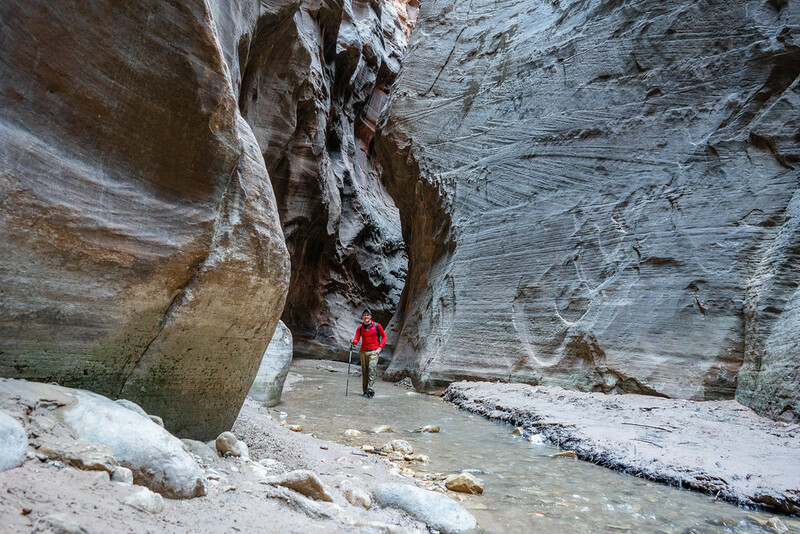 There are Narrow walls, which is where the hike gets its name, and there is no way to do this hike without getting wet. When we started off I rolled up my pants to keep them from getting entirely soaked, but by the end of the hike, I was having so much fun that I rolled them back down and just didn't care. Most of the hike is hiking through water of varying levels from ankle deep to over my knees and I am about 5 foot 7 inches tall. 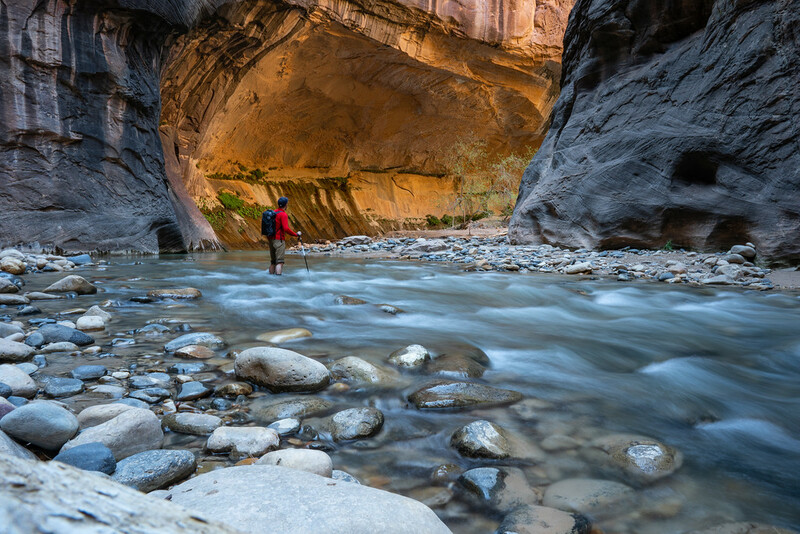 Hiking through the water is broken up by bounding from small pieces of sand that have built up as deposits along the route. 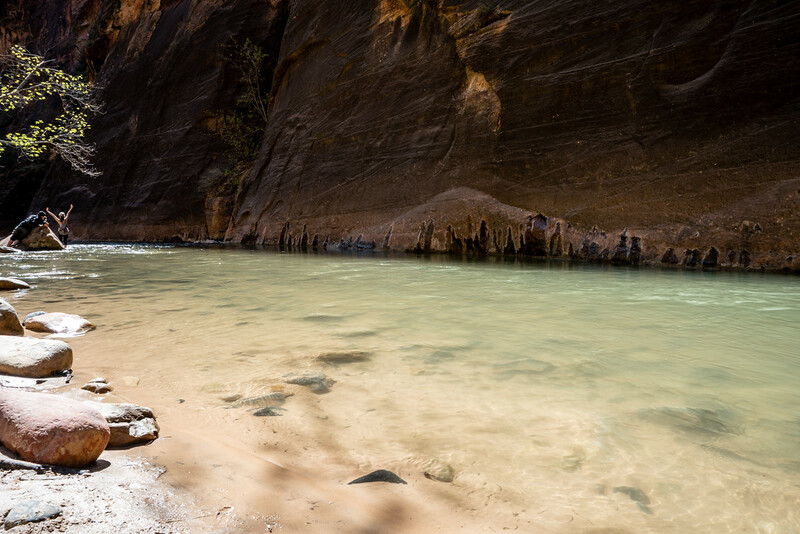 As we were hiking through the Narrows, we were treated to a view of some real canyoneers repelling down a small waterfall in wet suites. It looked like a ton of fun and I was only a little jealous. The further North we hiked the more the crowds thinned out. 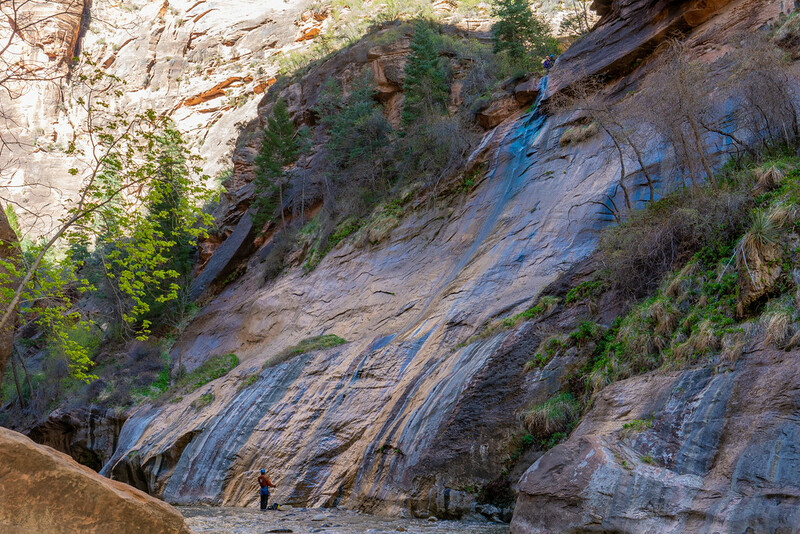 The more the crowds thinned out the more magical the hike became. Every step I took, every bend I looked around the place just got more beautiful and light more stunning! The further we traveled North the hike also got more Narrow. As the sun started getting lower and lower in the sky it became time for us to start thinking of turning around. We made one final strong push and made it to the for in the Canyon right before the Wall Street section started. I wish we could have gone further but I didn't want to be hiking in the water in the dark and the last bus would be leaving the trailhead at 8pm. The hike back south was my favorite part, we essentially had the Canyon to ourselves and I knew what the trail had in store for us having previously just hiked up it. So I took my camera tripod out and decided to be a little more bold with my nice camera in the river surrounded by water. Despite nerding out with photography on the way back, we made it back to the hike start in record time. Hiking through the water upstream definetly was a bit slower, we were more cautious and fighting the flow of the river. On the way back we were goign downstream not fighting the water and were a lot familiar with the trail. I cant wait to go back and ddo the top down version of this hike and spend the night camping!